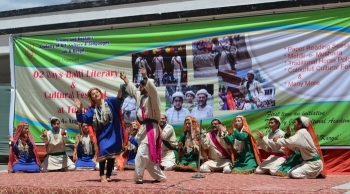 To preserve and promote the culture and language of Balti community, a two day long Balti Literary and Cultural Festival was organised jointly by J&K Academy of Art, Culture & Languages Leh and Kargil on August 3 and 4 in Turtuk. Mumtaz Hussain, EC Minority Affairs, Animal and Sheep Husbandry and Cooperatives was the chief guest on the occasion. The festival begins by featuring paper reading sessions on varied themes pertaining to Balti culture, society and folk traditions, poetic recital sessions, colorful folk music and dance performances by the artists from Nubra, Leh and Kargil. Appreciating the efforts of JKAACL, Leh and Kargil in organising the festival in Nubra valley, Mumtaz Hussain expressed hope that the event will go a long way in the preservation and promotion of Balti culture and folk traditions. He said that the festival will not only give boost to cultural tourism in the area but will also provide an ideal platform to the Balti men of letters to introspect and initiate discussions and dialogues on the challenges and opportunities to the language. Ghulam Mehdi, Councillor Turtuk and Nazir Ladakhi Hussain, Deputy Secretary Cultural Academy, Kargil underlined the importance of re-establishing the rich ancestral legacy of communal harmony, oneness and brotherhood in the region which forms the core of traditional Ladakhi values. They further added that the festival is a first-ever initiative to connect Balti community of Leh and Kargil together. Tsewang Paljor said that the academy’s aim and objective to promote and preserve the Balti culture and language. During the festival, research-oriented papers were presented on Balti culture, language and literature and divided families, poetic renderings, polo matches as well as colorful cultural programmes were showcased. The people of Balti tribe of Nubra Valley including Bogdang, Chulunka, Turtuk, Thang, Tyakshi & adjoining area highly appreciated the festival. Sonam Nurboo, SDM Nubra, Ghulam Mohd, SDM Kharu, Nissar Hussain, SHO Nubra, prominent citizens, writers, poets, artists, foreign and domestic tourists besides a large number of cultural and literary enthusiasts thronged the premises of Higher Secondary School Turtuk to witness the Festival.